An introduction to basic Alexander technique (AT) principles that can improve general functioning during daily life, increase confidence, and improve overall quality of life. Principles can be applied during normal daily activities as well as during any exercise program. For People Living with Parkinson's (PlwPD), as well as their whole Care Partner Team of spouses and other family members. Our goal is to demonstrate how adaptive Alexander-based programs can show PlwPD how to actively choose and use functional patterns that promote optimal postural tone, empowering them to manage their physical symptoms, increasing their independence and enhancing their overall quality of life. Non-motor symptoms such as anxiety, fatigue and sleep interruption can also be addressed using AT principles. This workshop also offers an opportunity for local Alexander technique (AT) specialists who have completed a specialized training in working with PwP to have the opportunity to apply and practice their skills with feedback from workshop participants. MONIKA GROSS is the Executive Director of THE POISE PROJECT, an independent nonprofit created in 2016 in the USA for the sole purpose of bringing the principles of Alexander technique (AT) to a broader population. Our mission is maintaining poise and personal growth throughout all stages and challenges of life. Monika presented the model for THE POISE PROJECT in a workshop in August 2015 at the 10th International Congress of the FM Alexander Technique at the University of Limerick in Ireland. Her strategic model draws on six years of research that grew out of her interest in facilitating broader access to the educational principles of AT through targeted initiatives, with "AT for Parkinson's" being the first. Monika is a senior teacher of the Alexander technique, had her first AT lesson in 1976, and was certified in 1985. She taught in New York City for 25 years and in North Carolina since 2010. From 2011-12 she was on the faculty of the Hayes School of Music at Appalachian State University. Monika is a member of the Western North Carolina AT teacher consortium: Alexander Teachers of the Mountain Region (ATMR), is a teaching member of the American Society for the Alexander Technique (AmSAT) and Alexander Technique International (ATI), and a Registered Somatic Movement Educator (RSME) with the International Somatic Movement Education & Therapy Association (ISMETA). Her particular passion is in preserving natural poise in children and youth. We have received three grants from the Parkinson's Foundation to deliver AT-based programs for people living with Parkinson's and their care partners in North Carolina and the Washington DC Greater Metro Area. To train participants in the mission and strategic model of The Poise Project so that they can become part of regional teams involved in expanding our ongoing AT4PD initiative, and launching new initiatives. Please consider joining our efforts! Even if your main interest may be with other populations, you will become part of our team effort to connect to regional communities by being trained in our Poise Project strategic model. And our training days are one of the ways that we are trying to be sustainable for the next eight years of this ten year project. Your participation supports financially all of our programs and outreach and research efforts. The training day will be led by Monika Gross, Executive Director of The Poise Project. Included will be training sections videotaped of Dr. Maya Katz, a movement disorder specialist at University of California San Francisco, as well as videos from people living with Parkinson's and their care partners who have benefitted from AT and are advocating for it as part of our AT4PD initiative. Participants in this team building day will be able to be part of our regional teams and future program trainings as we roll out programming in 2019 and moving forward. The Poise Project administered a grant from the Parkinson's Foundation to deliver an AT-based course for care partners of PlwPD at eight sites in North Carolina in 2017-2018. We have received a second grant to expand this program into Washington DC for Fall 2018. We will also be working to initiate patient referral programs in partnership with area neurologists modeled on a program we have in place in the Bay Area in Northern California. And we are currently administering a third grant from the Parkinson's Foundation to design and deliver an new AT-based course for PlwPD at three sites in NC. In relation to these programs, we are applying for funding for research projects to measure the efficacy and long term retention of AT training for PlwPD as compared to exercise programs and other interventions. Teachers who participate in this day of training will be considered part of the pool of teachers we will draw from for our future class programming and research projects for PlwPD and care partners as new classes are created and regional expansion occurs, as well as being part of the pool of AT professionals trained in our strategic model to assist in community outreach for all our future initiatives. Our focus during this training day will be on how AT can help PlwPD develop practical skills for more independent self-management of motor symptoms affecting their balance, gait and postural tone, including falls, freezing, forward neck posture and slowed movement, as well as non-motor symptoms such as anxiety, apathy, low volume speech, swallowing, and sleep interruption. AT can offer PlwPD hope and increase their confidence, independence, and overall quality of life. AT can help them chose optimal postural tone and improve their overall functioning during iADLs (instrumental activities of daily living). It can also give tremendous support and a more positive outlook to the spouses and other family members and care partners of PlwPD and greatly reduce caregiver burden and burnout. Training their care partners at the same time helps them learn how to cue PlwPD when cognitive decline may be present, which is often a later stage aspect of PD. The second half of the training day will include a focus on the particular needs of care partners of PlwPD, and can be generalized to how AT can support care partners in many situations, especially when the care receivers have cognitive decline. It will focus on how to deliver AT in a way that gives practical ongoing skills for care partners to manage the physical and emotional demands of caregiving. Working with middle and late stage PlwPD, particularly when there is cognitive decline. Report on THE POISE PROJECT AT for PD initiative and our targeted team presence at the 4th World Parkinson Congress in Portland OR in September 2016 as well as our continued broad outreach across the US and internationally, including launching an "International AT for PD Year of Awareness" in February 2018 in London and Dublin. How to include care partners to support learning and increase retention of AT principles for PlwPD, as well as to give them self-management skills to address the serious stresses of their own circumstances. Report on THE POISE PROJECT "Partnering with Poise" care partner courses that have been delivered at eight sites across North Carolina funded by the Parkinson's Foundation, and it's IRB research study through the University of Idaho managed by AT teacher and research scientist, Dr. Rajal Cohen. Meredith McIntosh, Monika Gross, Suzy Perkins and Shellie Cash at the Parkinson’s Foundation Moving Day October 2017. MONIKA GROSS is Executive Director of The Poise Project, a nonprofit with the mission of maintaining natural poise and continuous personal growth throughout all stages and challenges of life through the principles of Alexander technique (AT). The Poise Project is committed to removing barriers and making AT available across socio-economic groups and to those with chronic conditions. As of Fall 2018, it has received three Parkinson's Foundation Moving Day® Community Grants to deliver AT-based classes to people in the Parkinson's community in North Carolina and in Washington DC. She has conducted this AT or Parkinson's teacher training and established a patient referral program in the Bay Area in partnership with Dr. Maya Katz, a movement disorder specialist at UCSF. Monika is co-owner of Form Fitness & Function, and has a private AT practice in Asheville NC. She also offers AT training via Skype or Zoom. 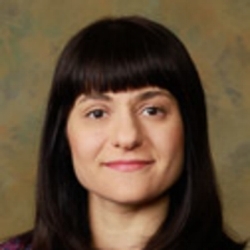 DR. MAYA KATZ is an Assistant Professor of Neurology at the UCSF Movement Disorders and Neuromodulation Center. She specializes in the treatment of Parkinson's disease, essential tremor, dystonia and other movement disorders. Her research interests include identifying disease modification strategies and improving outcomes for patients treated with deep brain stimulation. She is also interested in developing multidisciplinary clinical approaches that incorporate palliative care principles. LOCATION: Shirley Ryan Activity Lab, 355 East Erie Street, Chicago IL 60610. 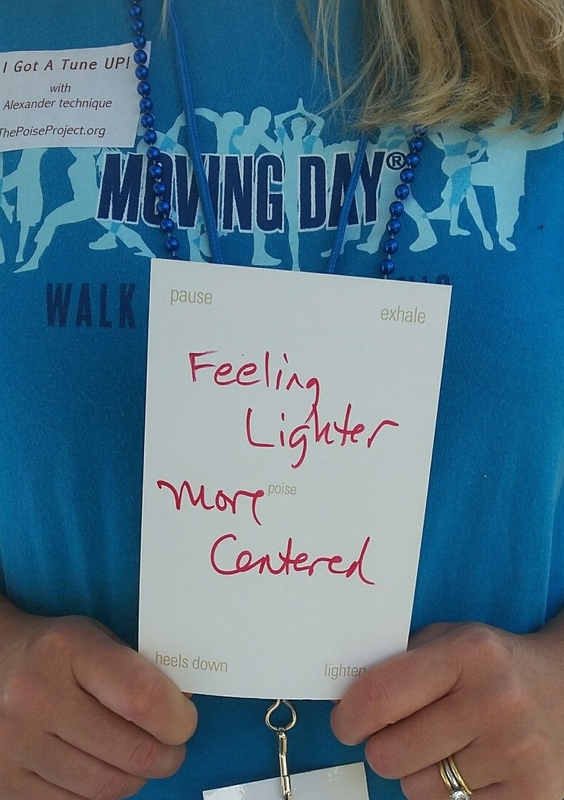 Participants in the training day will also be invited to be part of The Poise Project team at the Parkinson’s Foundation Chicago Moving Day® event the next day - Sunday, October 14. We will have a resource table, and offer “Poise Tune Ups” at the table, as well as have a “Poise Tune Up Station” the course during the walk. You can see photos from other Moving Day’s where we’ve offered this at this link. Participants in the workshop will also be invited to be part of The Poise Project team at the Parkinson’s Foundation Boston Moving Day® event that Saturday, October 13. We will have a resource table, and offer “Poise Tune Ups” at the table, as well as have a “Poise Tune Up Station” the course during the walk. You can see photos from other Moving Day’s where we’ve offered this at this link. Please use the links above to register for the course of your choice. This course offers a supportive group setting to learn skills and strategies based on Alexander technique (AT) to manage the many daily physical and emotional challenges that Parkinson's brings into your lives. The program consists of a ten-week group class meeting for 90 minutes per week. It is understood that not all participants will be able to attend all classes. Click here to download a flyer about the course. This course is part of an ongoing IRB approved research study on caregiving through the University of Idaho. The study involves two 60-minute individually scheduled pre- and post-class evaluation sessions, two 45-minute pre- and post-class online surveys, and a brief post-course evaluation form. Click here to download a flyer about the research study. 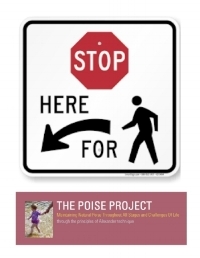 The Poise Project® is a nonprofit with the mission of maintaining poise and personal growth throughout all stages and challenges of life using the principles of Alexander technique (AT). We design and deliver Alexander-based programs that give people living with Parkinson's greater confidence to manage their physical symptoms and increase their independence, confidence, and quality of life. We will also be recruiting for participants for a course for care partners of PlwPD that is launching at two sites in Greater DC starting the week of September 24, 2018. The course is free to participants and is paid for by a grant from the Parkinson's Foundation. MONIKA GROSS is the Executive Director of THE POISE PROJECT, an independent nonprofit created in 2016 in the USA for the sole purpose of bringing the principles of Alexander technique (AT) to a broader population. Our mission is maintaining natural poise throughout all stages and challenges of life. Monika presented the model for THE POISE PROJECT in a workshop in August 2015 at the 10th International Congress of the FM Alexander Technique at the University of Limerick in Ireland. Her strategic model draws on six years of research that grew out of her interest in facilitating broader access to the educational principles of AT through targeted initiatives, with "AT for Parkinson's" being the first. The main objective of this training day will be to learn about the particular needs of People Living with Parkinson's (PlwPD) and their care partners, and to suggest the most successful ways to apply Alexander principles when working with this population. If you are interested in working with PlwPD in your practice, please join this training day. The second objective is to train participants in the mission and strategic model of The Poise Project so that they can become part of regional teams involved in expanding our ongoing AT4PD initiative. Please consider joining our efforts. Even if your main interest may be with other populations, you will become part of our team effort to connect to regional communities by being trained in our Poise Project strategic model. Space is limited, so please book early! Medical and allied health professionals, including doctors, nurses, physical therapists, physical therapy assistants, occupational therapists, speech language pathologists, social workers, psychologists, licensed professional counselors, mental health professionals, clinicians, health and human service practitioners, and other health care professionals, as well as exercise professionals and athletic trainers. The Alexander technique (AT) is a tool for patient self-management. AT is an educational approach to improving functional patterns of posture and movement during everyday activities. Training in AT principles helps patients develop a better self-orienting way of thinking that is then combined with whatever they are doing in their daily lives. Adaptive Alexander-based programs show clients how to choose functional patterns that promote optimal postural tone. This helps them increase motor self-management and enhances their independence and overall quality of life. Training in AT principles fundamentally develops the individual's overall ability to make mindful choices about how to respond to the stressors of life, whether they are psychological or physiological in origin. This workshop will clarify the role of the AT specialist in enhancing a patient's ability to be a more active, skilled partner in both preventative and rehabilitative care while increasing the potential for increased benefit from all care team interventions. Identify the history and development of Alexander technique (AT) as an embodied mindfulness approach. Summarize AT principles and how they relate to human functioning, agency, self-regulation, and overall retention of Self. Describe the role of the AT specialist in patient care and the specialized training necessary for certification. Identify the benefits for patients in training in AT principles. Discuss existing research indicating the benefits of AT principles to particular target populations. Recognize the methods used by AT specialists to train individuals in the AT principles in a variety of delivery settings. Offer participants the opportunity to learn by experiencing a small sampling of these training methods. Apply ways to cue and support patients in reinforcing their new AT-based orientation. Our Workshop has filled to capacity, so unfortunately we can no longer take reservations. 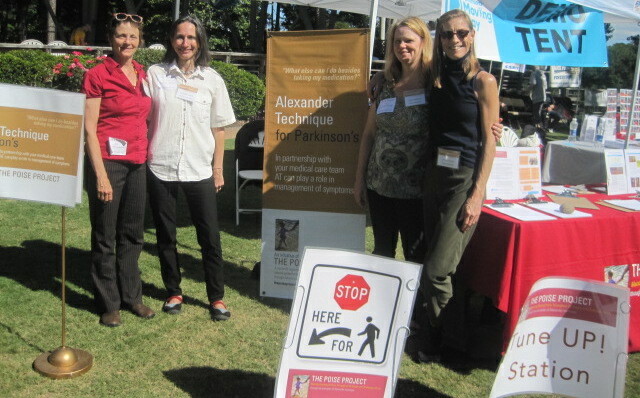 However, we will be organizing more Alexander technique (AT)-based workshops and classes for the Parkinson's community in San Diego! We also will be able to connect you to local AT specialists. If you would like us to keep you informed, please click on the link below and fill out the form and we will contact you about any future AT lessons, workshops or classes in the San Diego area! The main objective of this training day will be to learn about the particular needs of People Living with Parkinson's (PlwPD) and their care partners, and to suggest the most successful ways to apply Alexander principles when working with this population. The second objective is to train participants in the mission and strategic model of The Poise Project so that they can become part of regional teams involved in our ongoing AT4PD initiative. We are reaching out to PlwPD and care partners from the local community who we will be invited to attend an informal 90-minute workshop during the training day. In this way the training day participants will be able to have the opportunity to work with them and receive their feedback. The Poise Project has a grant from the Parkinson's Foundation to deliver classes for care partners of PlwPD at eight sites in North Carolina in 2017-2018. We have received a second grant to expand this program into Washington DC in 2018-2019. We will be working to expand this and other programs into Southern California. We will also be working to initiate patient referral programs in partnership with area neurologists, as we have in place now in the Bay Area. Teachers who participate in this day of training will be considered part of the pool of teachers we will draw from for our future class programming and research projects for PlwPD and care partners as new classes are created and regional expansion occurs. MONIKA GROSS is Executive Director of The Poise Project, a nonprofit with the mission of maintaining natural poise and continuous personal growth throughout all stages and challenges of life through the principles of Alexander technique (AT). The Poise Project is committed to removing barriers and making AT available across socio-economic groups and to those with chronic conditions. It has received a $25,000 Parkinson's Foundation 2017 Moving Day® Community Grant to deliver AT-based classes to care partners of people living with Parkinson's disease at six sites across North Carolina. She has conducted this AT or Parkinson's teacher training and established a patient referral program in the Bay Area in partnership with Dr. Maya Katz, a movement disorder specialist at UCSF. For People Living with Parkinson's (PlwPD), as well as their broader Care Partner Team of spouses and other family members. For People Living with Parkinson's (PwP), as well as their broader Care Partner Team of spouses and other family members. We regret that this 6 Februrary 2018 workshop is now at capacity. However, we will be organising other workshops over the next few months. where you can fill in a workshop notification form. We very much look forward to introducing you to the benefits of Alexander technique for people living with Parkinson's and their care partners! As a Person Living with Parkinson's (PwP) you can learn how to begin applying Alexander-based strategies to help improve your balance, alignment and movement, and prevent falls and "freezing." 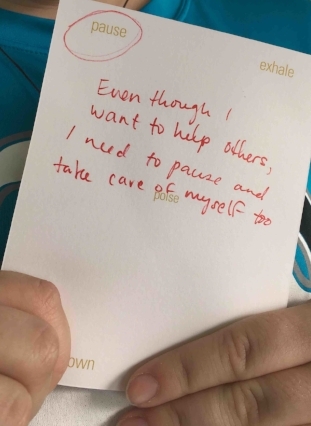 As a Care Partner of a PwP you can learn how to begin applying Alexander-based strategies to help meet the day-to-day physical and emotional stresses of caregiving. Our goal is to demonstrate how adaptive Alexander-based programs can show PwP how to actively choose and use functional patterns that promote optimal postural tone, empowering them to manage their physical symptoms, increasing their independence and enhancing their overall quality of life. Non-motor symptoms such as anxiety, fatigue and sleep interruption can also be addressed using AT principles. This workshop also offers an opportunity for Alexander technique (AT) specialists who have completed a specialized training in working with PwP to have the opportunity to apply and practice their skills with feedback from workshop participants. Cost: €120 Teachers; €90 Trainees. The main objective of this course will be to learn about the particular needs of People Living with Parkinson's (PlwPD) and to suggest the most successful ways to apply Alexander principles when working with this population both in one-to-one and group settings. You will learn about the motor and non-motor symptoms of PD as well as the wide variety of PD diagnosis. Our focus will be on how AT can help PlwPD develop practical skills for self-management of motor symptoms affecting balance, gait and postural tone, including falls, freezing, forward neck posture, and slowed movement, as well as non-motor symptoms such as anxiety, apathy, low speech volume, swallowing, and sleep interruption. AT can offer PlwPD hope and increase their confidence, independence, and overall quality of life. AT can help them chose optimal postural tone and improve their overall functioning during iADLs (instrumental activities of daily living). For the second part of the training day, you will learn about the particular needs of care partners of PlwPD. AT can also give tremendous support and a more positive outlook for the spouses and other family members and care partners of PlwPD. Training care partners at the same time as their care receivers helps them be able to better cue PlwPD when cognitive decline may be present, which is a late stage aspect of PD. This training will focus on how to deliver AT in a way that gives practical ongoing skills for care partners to better take care of themselves as they navigate the special physical and emotional demands of caregiving. This training can be generalized to how AT can support care partners in many other caring situations as well, especially when the care receivers have cognitive decline. Outcomes will be shared from The Poise Project's current research study on "Partnering with Poise," an AT-based course for care partners that is being funded by the Parkinson's Foundation. All participants will have the opportunity to practice working with people living with Parkinson's and their care partners during this Tuesday training day. Individuals from the local Parkinson's community are being invited to attend an hour and a half workshop with us during the training day. This will give teacher participants the opportunity to practice both one-to-one and group interactions and share and receive feedback from workshop participants. The training will be led by Monika Gross, Executive Director of The Poise Project, along with Glenna Batson ScD., PT and Research Consultant for The Poise Project. We will also be viewing two training videos of Dr. Maya Katz, a movement disorder specialist at UCSF, who is a collaborator in our teacher trainings in the US. The first covers basic information about all the stages and symptoms of Parkinson's and the areas that she feels AT can be of particular help. It will include illustrative video clips of particular patient cases. The second covers the special needs of care partners in the Parkinson's setting. The Poise Project has partnered with Dr. Katz to set up a patient referral program for PlwPD to work with AT teachers in the Bay Area. Teachers who participate in this Dublin training day will be considered to be trained to become part of a pool of teachers we will draw from for any similar patient referral projects and future AT-based group class programming that we are able to establish in Ireland moving forward. The purpose of this training day in Dublin is to offer AT teachers and trainees in Ireland a specialized training in basic information about working with PlwPD and their carers, both for their private practice enrichment, but more importantly as part of The Poise Project's AT for Parkinson's initiative. We will use the funds from the training fees for administration to help develop future programming in Ireland. The Poise Project has been developing specific programming for PlwPD and their carers in the US, including patient referral programs, funded group courses and short term workshops. We have received two grants so far from the Parkinson's Foundation to deliver AT-based courses specifically for care partners. Over the next year we will be working to initiate similar programming in other countries. Monies collected for this training day will assist in making this possible in Ireland. Monika will share the structures created for successful workshops The Poise Project hosted in the US that gathered together the greater Parkinson's community for learning together about AT, including PlwPD and their care partners, as well as medical and allied health professionals, research scientists, exercise trainers, and leaders in local Parkinson's communities. Space is very limited, so please book early! Working with middle and late stage PwP, particularly when there is cognitive decline. Your participation in this training day in Dublin is part of the launch of a year-long international project: AT4PD - Alexander Technique for Parkinson's Awareness Initiative. 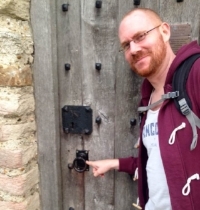 Dan Shepherd, a trainee in Anthony Kingsley's teacher training program in London, reached out to Monika a few months ago to see if The Poise Project could join him in creating a series of "AT for Parkinson's Disease Awareness" (AT4PD) events for media promotion. Together they are leading a teacher training day in London on Saturday, 3 February followed by a 4.5 hour public workshop on Sunday, 4 February. Questions about the training day? Monika Gross leading workshop for PlwPD and their carers. Constructive Teaching Centre, London. October 2016. All training day participants will have the opportunity to practice with people living with Parkinson's and their care partners as part of this Saturday training day. Individuals from the local Parkinson's community are being invited to attend an hour and a half workshop with us during the training day. This will give teacher participants the opportunity to practice both one-to-one and group interactions and share and receive feedback from workshop participants. 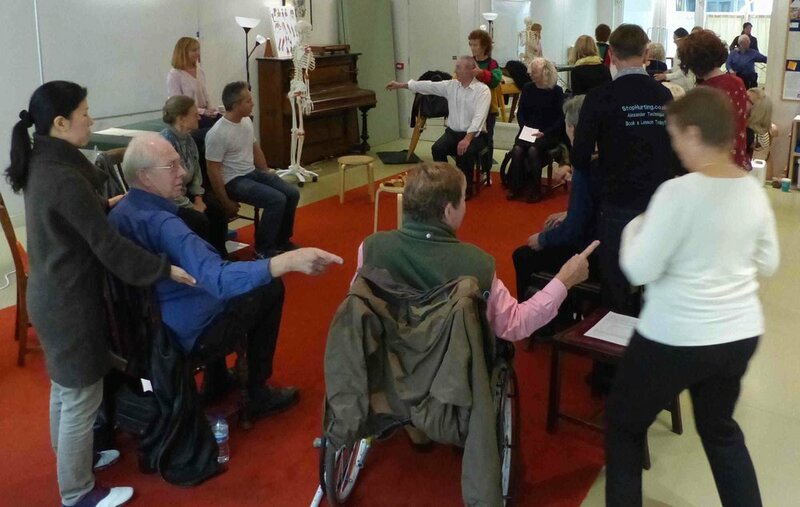 As many training day certified teacher participants as we can accommodate will also be invited to take part as volunteer teachers in the public workshop the following day, on Sunday, 4 February, 2018, that Dan Shepherd and Monika Gross have organized as part of an international Alexander Technique for Parkinson's (AT4P) Awareness Day. Donations raised will go to The Walter Carrington Educational Trust for their AT for Parkinson's program. The training will be led by Monika Gross, Executive Director of The Poise Project, along with Glenna Batson ScD., PT and Research Consultant for The Poise Project. Daniel Shepherd will also speak about the AT4PD - Alexander Technique for Parkinson's International Awareness project. We will be viewing two training videos of Dr. Maya Katz, a movement disorder specialist at UCSF, who is a collaborator in our teacher trainings in the US. The first covers basic information about all the stages and symptoms of Parkinson's and the areas that she feels AT can be of particular help. It will include illustrative video clips of particular patient cases. The second covers the special needs of care partners in the Parkinson's setting. The Poise Project has partnered with Dr. Katz to set up a patient referral program for PlwPD to work with AT teachers in the Bay Area. Teachers who participate in this London training day will be considered to be trained to become part of a pool of teachers we will draw from for any similar patient referral projects and future AT-based group class programming that we are able to establish in the UK moving forward. GLENNA BATSON, ScD., MA, M.AmSAT, M.ISATT is a Research Consultant for The Poise Project. Glenna is a graduate of Hahnemann Medical University in Physical Therapy. She holds a Masters in dance education and received her doctorate in clinical neurology in 2006. Glenna certified as an Alexander technique instructor in 1989. For twenty-two years, she was a professor of physiotherapy (Masters and Doctor of Science) in America for the North Carolina State University system, where she pioneered a number of research projects in integrative medicine, studying the effects on balance of these different complementary approaches: Alexander Technique and motor imagery for the community elderly and elite dancers, and improvisational dance for Parkinson’s disease. She is Professor Emeritus at Winston-Salem State University and Research Associate Professor in Health & Exercise Science at Wake Forest University. A Fulbright Senior Specialist, Glenna completed residencies in dance science and Somatics at Trinity-Laban Conservatoire of Music and Dance, London, and the Universities of Tallinn and Tartu in Estonia. Her career has taken her down four intertwined paths: dance, body-mind education (Somatics), human movement science, and rehabilitation medicine. Seeing the art in science and the science in the arts, Glenna has written many articles to unify concepts from these distant disciplines as to ignite interest in the crossing tributaries of knowledge. In 2014, two of her books were published: Body and Mind in Motion: Dance and Neuroscience in Conversation and (as co-editor and contributor) Dance, Somatics and Spiritualities: Contemporary Sacred Narratives. Glenna has advocated for Alexander technique work for many years and has taught in over 13 countries worldwide. In 2015, she co-directed the 10th World Congress for the Alexander Technique at the University of Limerick in 2015. Glenna lives with her husband in Newbridge, Co. Kildaire, Ireland. For People Living with Parkinson's (PwP), as well as their broader Care Partner Team of spouses and other family members, as well as Research Scientists, Allied Health Professionals and other Medical Care Providers.